I realised then that I must be still asleep and dreaming so I said, “No.” And saying it woke me up. […] The draught was plainly blowing from one side of the landing; it was blowing, in fact, from a large cupboard. You’d think it’s an airing cupboard, being where it is, but it’s not, and it’s too shallow from front to back to be a lot of use for anything. It tended to fill up with stuff I couldn’t be arsed to throw out, or that I use once or twice a year: Christmas decorations, board games, old greeting cards, the remains of a coffee set of my great-aunt’s, a broken tennis racket, magazines I’m going to throw out when I’m sure I don’t need to keep them – you know the sort of thing. Now here’s the problem. This cupboard is on an inside wall, and it doesn’t have a chimney. So there couldn’t be a draught blowing out of it, right? I put down the candle, which promptly blew out, and opened the cupboard door. Inside was quite a large space, dusty and untidy, and still containing the things that should have been in there, but considerably larger than when I last looked. In the middle, sitting on a heap of old magazines, was a tall, pale woman. 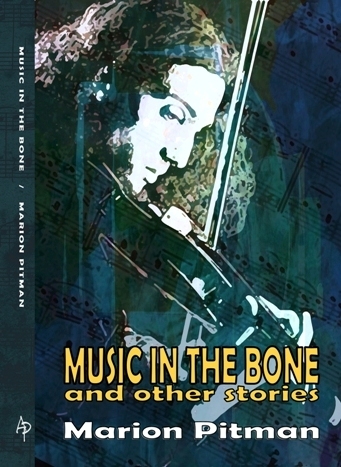 “The Cupboard of Winds” is included in Music in the Bone and Other Stories by Marion Pitman. Available from Amazon UK, Amazon US and other online book sellers.